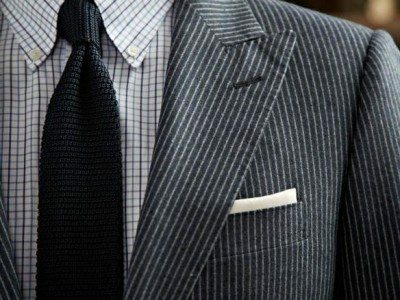 With an introduction of the men’s suit jacket successfully behind us, as well as a more detailed men’s suit discussion, it is now the time to complete our examination of the elements of the suit jacket. With a firm grasp of the elements that make up the core of the jacket, we can now look into the details that transform a jacket from ordinary clothing into a distinctive and individual feature of the wardrobe. 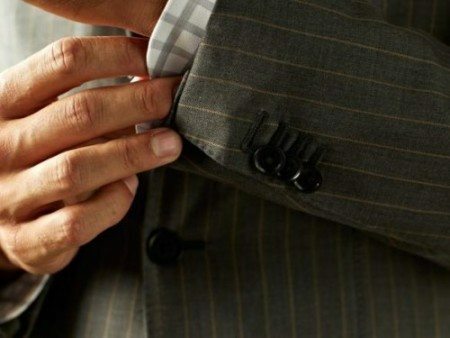 There are numerous historical reasons for jacket sleeves bearing buttons, from encouraging the use of handkerchiefs to allowing a gentleman to wash his hands without removing his jacket, a traditionally grave social offense in mixed company. Whatever the reason for their arrival on jacket sleeves, they now form an important part of the detail work or trimming of the jacket. Most traditionally, men’s suit jacket sleeves bear four buttons, though it is not uncommon to find three. Regardless of number, they should always match the waist buttons, and are always placed within a half-inch or so of the hem. On bespoke suits, and even some of the higher-quality made-to-measure jackets, the sleeve buttons are functional, though there is little reason to ever use them – rather, it is a subtle declaration of the jacket’s quality. When the buttons are functional, there is some temptation to leave one button undone in order to draw attention to the feature – and by extension, the quality of the men’s suit – though this is a matter of personal taste. Moving on from the jacket sleeves, we have the pockets, which present a variety of options, all at differing levels of formality. 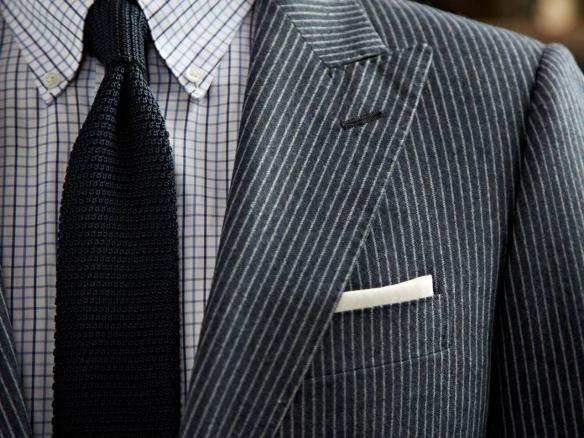 The most formal are jetted pockets, where the pocket is sewn into the lining of the jacket and only a narrow horizontal opening appears on the side of the suit jacket. These pockets, being nearly invisible, contribute to a very sleek, polished appearance, and are most frequently found on formal-wear. The next style, the flap pocket, is slightly less formal, though it is perfectly acceptable in all the circumstances where a gentleman is likely to be found in a men’s suit. Flap pockets are made identically to jetted pockets, but include a flap sewn into the top of the pocket, which covers the pocket’s opening. These are the most common pockets on men’s suit jackets, and in the very best, are fabricated so that the wearer may tuck the flaps inside, mimicking the jetted pocket. There are also diagonally-cut flap pockets known as hacking pockets, though they are somewhat less common; the hacking pocket is derived from English riding gear, and is most prominent on bespoke suits from English tailors, particularly those traditionally associated with riding clothes. The least formal are patch pockets, which are exactly what the name implies: pockets created by applying a patch to the outside of the jacket. Patch pockets are the most casual option; they are frequently found on summer suits that would otherwise appear overly formal, as well as on sports jackets. 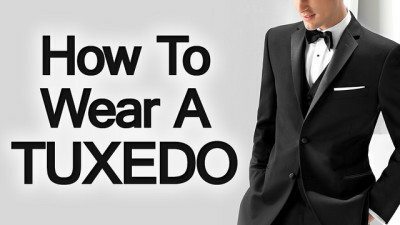 On the subject of pockets and things the conscientious wearer avoids, there are a few guidelines for utilizing the pockets on suit jackets. While the outside pockets on most jackets are functional, placing large bulky items – including the hands – in these pockets will distort the silhouette of the jacket. Keys and other sharp objects should be kept away from the jacket pockets, as they can damage the lining, leaving holes into which small objects are invariably drawn. Many jackets come with the pockets sewn shut, and while it is generally better to open them, those who have difficulty remembering what to avoid may find it beneficial to leave them unopened. The side pockets are not the only pockets on the jacket, however. Some men’s suit jackets, particularly bespoke and finer made-to-measure offerings, include a small ticket pocket above one of the side pockets, generally on the same side as the wearer’s dominant hand. This pocket is rarely used in modern times, and serves more as an indication of the suit’s quality. 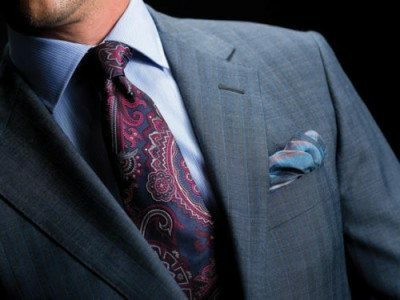 Moving up the jacket is the breast pocket, which is always open, and into which only one item is ever placed: the handkerchief or pocket square. First, like the side pockets, any items placed in the breast pocket create lumpy projections which distort the sleek appearance of the suit. second, the breast pocket and the inside left pocket share the same space in the jacket’s lining, meaning that objects in the breast pocket tend to force items in the inside pocket into the wearer’s ribs, which is quite uncomfortable. Inside pockets vary greatly, with some jackets having only one, usually on the left, though it is more common to have pockets on both sides. These pockets are generally large enough to carry a checkbook-sized wallet or card case, as well as a pen and perhaps tickets or other similar papers, though one should be careful, as bulky items, even in the inside pockets, can distort the jacket’s appearance. 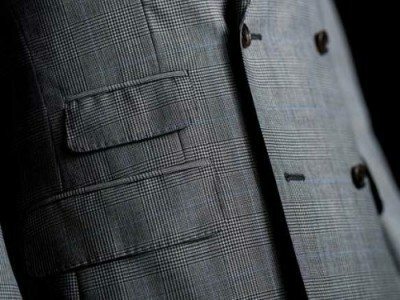 On bespoke suits, the options for pockets are only limited by the wearer’s imagination, as a good tailor can create specialty pockets sized to hold a variety of useful items. In today’s world of technology, such pockets provide the perfect place to store items like cell phones and iPods. Moving on from pockets we find the vents, flap-like slits in the bottom of the jacket which accommodate movement and offer easy access to the trouser pockets. Men’s suit jackets have three styles: center, side, or none. Ventless suit jackets, just as the name implies, have no vents, and are popular on Continental suits; they provide a very sleek look to the back of the jacket, though they can lead to wrinkling when the wearer sits down. Center-vented jackets, very popular on American suits, have a single slit at the back, allowing the jacket to expand at the bottom when sitting. Because of its placement, center-vented jackets have a habit of exposing the wearer’s posterior, though most seem not to mind, as center vents remain the most popular style. A side-vented jacket has two vents, one on either side, generally just behind the trouser pockets, to provide easy access. Side vents also facilitate sitting more easily, moving as needed to prevent the rumpling of the jacket back, which leads to creasing. A last bit of trimming concerns the lapels. 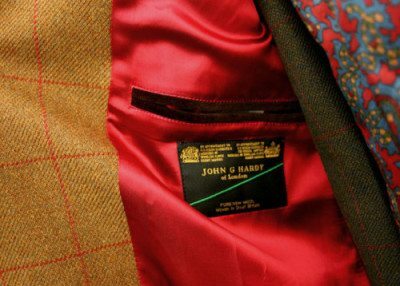 Most jacket lapels include a button hole on the left lapel, roughly an inch below the gorge, which is generally sewn shut. On very high quality jackets, there will be a corresponding button on the right lapel, though this is merely an element of style, as the lapels of a suit jacket are never turned up in the manner of a military uniform. On most any suit, the buttonhole can be opened, and on the very best, there will be a small fabric loop on the underside of the left lapel, just below the buttonhole. 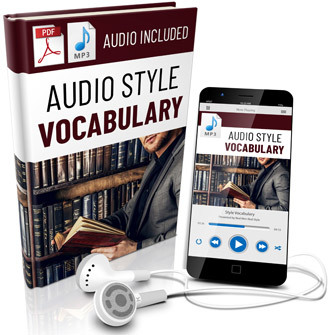 This is to facilitate the boutonnière, a small flower worn on the lapel, though the practice is generally confined to important participants in special occasions, e.g. the groom and groomsmen at a wedding or dignitaries at a memorial service. Anyone choosing to wear a boutonnière on a regular basis is making a bold-yet-elegant choice. Thus we finish our study of the suit jacket, though there is still a great deal to be learned about suit color, suit pattern, suit fabric, all of which we shall address in their own in-depth discussions.